My first motivation for doing this research was curiosity. 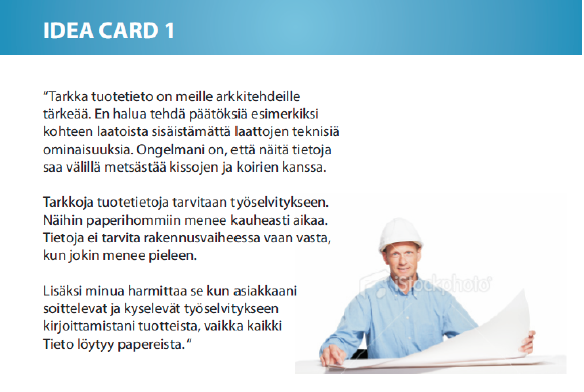 I work as a Marketing Manager at Kaakelikeskus, which is a tile importing company in Finland. I wanted to get to listen to architects who use the company’s service. The easiest way to do this was to book interviews with them, so I did. Luckily an experienced salesman gave me a client list worth of gold. Without the list, I would have been in trouble. I booked nine people for interviewing and spent about ten hours discussing with them about their challenges. I also started reading what they read (architecture and product brochures). Just out of curiosity, I also interviewed two sales people to see how they saw client challenges. Interpreting the interview data was a tough job. It helped a lot that I had recorded the interviews to my mobile phone. 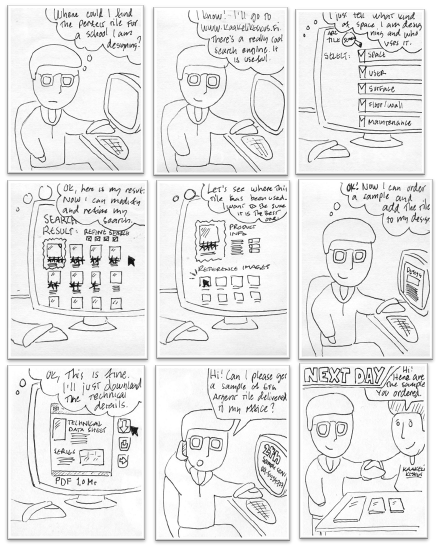 During the interviews, I had sketched some drafts for a new service. By listening the tapes, I could sketch some more. After the interviews, I had a lot of ideas for new services, but I didn´t want to show them to clients just yet. I wanted to get ideas from the company’s side too. I knew that the salespeople would gladly help me, but they needed something to focus on, some problems to be solved. I molded some of the client challenges into simple “challenge cards”. A card would include a quote from the interviews. For example, one client said: “Construction product suppliers do not realize the importance of continuity. 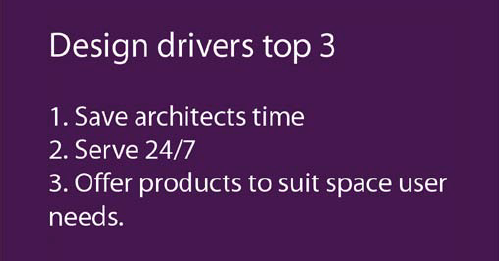 In large projects products may change many times in a three-year design process. Products are cancelled, and new ones are presented. We have to come back to the design to change products… And how can you renovate the building, if the same products are not available after a few years?”. I organized a co-creation workshop for sales staff, and we brainstormed new ideas. We also tried to make a service blueprint, which failed miserably because of lack or time. After I had all the data and ideas from the co-creation workshop, I organized it into an affinity diagram. I combined some client ideas and sales peoples ideas to 12 new service concepts. 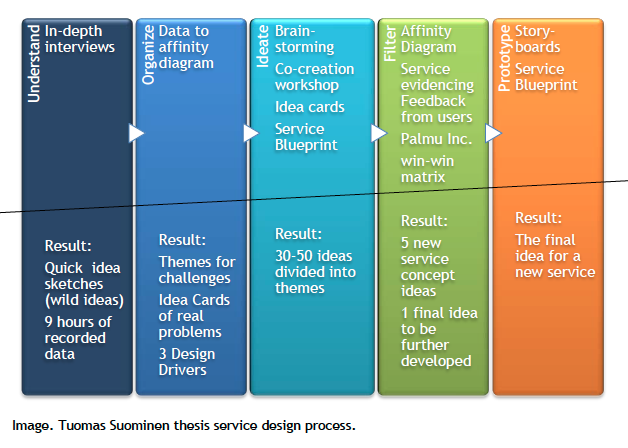 After this, I used service design agency Palmu´s win-win-matrix to evaluate the ideas. I used the matrix because it was easy to use and understand. The matrix advised me to find solutions that have the best business value to customer experience ratio. Best ideas provided value to both service provider and user. The ideas that survived the win-win test also had to endure the design driver test. Five ideas did. I converted them into service idea sheets, small brochures of a future service. The brochure would presente how the service would work and what value it would bring to clients. I sent these sheets to architects to be evaluated. They helped by identifying the best of these services. A breakthrough happened, when an architect suggested we could combine three service ideas into a new service process. The final new service would include not just one, but three designed touchpoints. The first touchpoint was a completely new architect tile search engine at the company website. The search engine takes into consideration how architects like to select products and who operates the space. 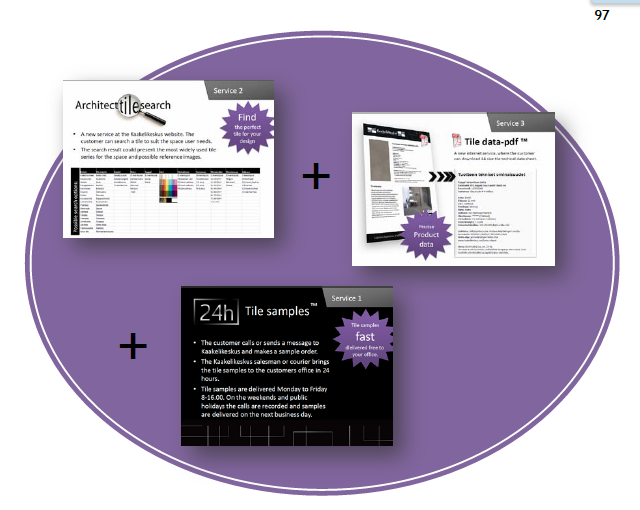 The second touchpoint is a PDF-converter that can convert any product info sheet at the website into a form architects need for their plans. After the architect has pre-selected some products, a 24 hour tile samples service will bring the real tile samples to his office table. I created a service blueprint and a storyboard to show how the new service path would generate value for both parties. The storyboard proved its worth when presenting the new service to the company board. This design case teached me the power of co-creation and how to turn customers challenges into new services. In this case, I had lots of ideas, but a service users provided the final idea. I noticed that people open up to you if you are genuinely interested about their doing. The challenges they face provide valuable insight for companies. I am confident that the same service process can be used for nearly any service design case, tough it is simple and easy to execute. You need service user volunteers and some time for ideation. The most important lesson I learned during this thesis project was that you don´t have to be an ”idea wizard”. You need to listen carefully and ask the right questions. Service users may end up being your best service designers. 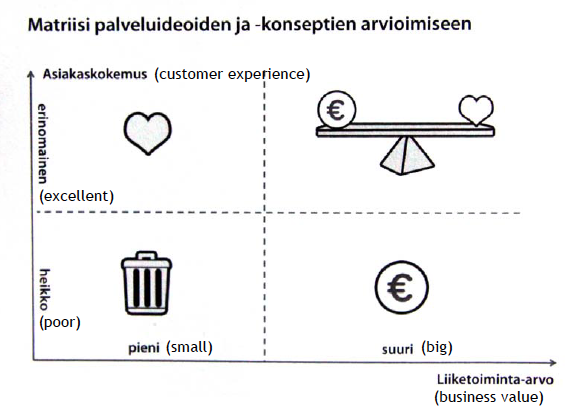 ← Service Design Breakfast #7, Reima Rönnholm, Palmu Inc.